Is survival becoming mainstream? If we were to look at the interest on the topic from the TV companies, it would seem so.Take the National Geographic Channel, for example. They have gradually switched their focus in the last few years from documentaries on the wilderness (such as Untamed Americas) to reality series on the men living in these wilderness. Let’s check out their latest productions in this post: the popular Doomsday Preppers and two survival series coming up in 2 weeks: Ultimate Survival Alaska and Life Below Zero (watch their trailers!). Ultimate Survival Alaska is a new reality series going to be aired on Sunday 12th of May 2013. 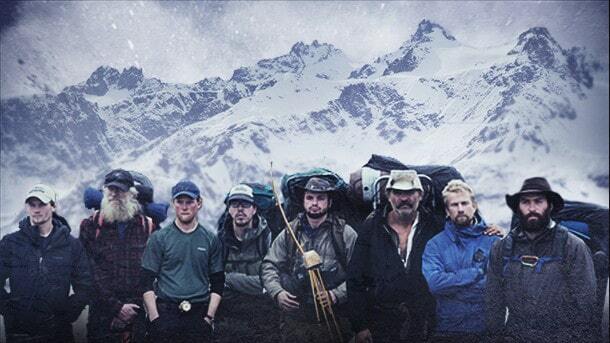 The series follows 8 extreme survival experts competing in a 3.ooo miles mission through the Alaskan wilderness in Arctic, brutal and dangerous terrains and conditions, without watch, phone, GPS or any other electronic aids. Their purpose is to survive and complete the 72 hours missions (each episode a mission), only using just the gear they can carry on their backs. Very old school! Life Below Zero is another new survival reality series, premiering on May 19, 2013. With similarities to Ultimate Survival Alaska, Life Below Zero is that too based in Alaska, and follows 6 survivalists (some of them have families beside them, some are lone wolves) living in unpopulated areas of the Alaskan wilderness, fighting for their survival during the long long dark dark cold cold Alaskan winter. The series starts with their preparation for the winter months and then shows their battles for the most basic necessities against snow storms, man-eating carnivores, questionable frozen terrain and limited resources when temperatures drop as bad as minus-60 degrees. Doomsday Preppers, now in the middle of its second season, is the network’s most-watched series (more than 1.3 million people watched the premiere of Season 2, aired in November 2012) and it’s the highest-rated show in the history of the National Geographic Channel. This surely demonstrates the huge interest around prepping, which is simply the act of preparing for whatever aftermath might come. The series explores the lives of ordinary Americans who are preparing for the end of the world as we know it. In each episode, you watch interviews to the preppers preparing to survive different scenarios, such as economic collapse, societal collapse, electromagnetic pulse, terrorist acts, nuclear incidents, fuel shortages, war, pandemics etc. The series shows a big variety of the beliefs, motivations, approaches and strategies of the preppers and this is one of the key success factors of this series. But each episode also details the actions taken by the preppers and ends with an expert analysis and recommendations for improvements – another stimulating reason to watch. And surely another key success of this series is the interest in prepping in the US, which is historically part of the US culture, but has also been hugely growing in the last years as USA Today underlines in an article on Doomsday Preppers.